Thousands of the nation’s top breeders, groomers and veterinarians use this revolutionary natural product on their own dogs and cats. 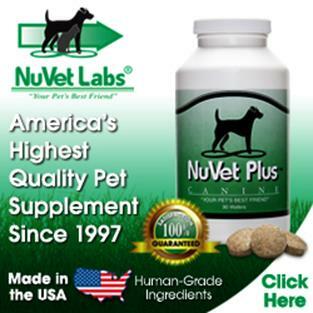 NuVets products are made of a natural, human grade daily supplement with no artificial sweeteners or flavors. So pure, it’s one of the few pet products manufactured in an FDA pharmaceutical manufacturing facility. There are both dog and cat formulas available and comes with a 60 day money-back guarantee. Get your pet healthy and keep your pet healthy by ordering yours today! Choose between Canine or Feline: combats the onslaught of free radicals in our companion pets. This unique formula consists of precise amounts of vitamins, minerals and high-potency antioxidants that when combined, create a synergistic and powerful boost to the immune system. 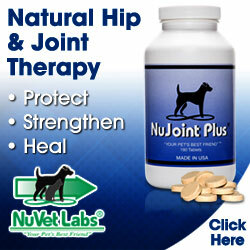 Natural anti-inflammatory hip and joint therapy, formulated with the finest pharmaceutical, human grade ingredients. Major considerations are the use of pharmaceutical grade ingredients and their healing values, as well as the bio digestibility and utilization into the cellular framework. For domestic, Cananda, and international orders, call (800) 474-7044 to place your order. Use code #68176.